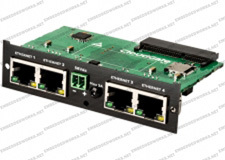 This is the 4-port Ethernet Switch expansion module for the Cloudgate router, also incorporating passive Power Over Ethernet (POE). This enables the router to be powered by just using the LAN ethernet cable, along with a seperate POE injector. Just remove the cover plate on the router and plug this board in. Some modules are auto-configured, and some require configuration in the router setup menu.